At Carroll, the Physics program is designed to acquaint students with topics like relativity, quantum physics, and optics—topics you don't generally see in the introductory courses for engineering and natural science majors. The focus of the major is on introducing you to the basic ideas of modern physics: along the way, you'll hone your mathematical problem-solving skills, create computer simulations, and do labs with lenses, lasers, and holography. The physics major program is intended to help students develop into successful and creative thinkers, who are able to analyze a wide variety of problems, apply appropriate models to them, and derive quantitative predictions from those models. These problem-solving skills are developed in the context of a curriculum which provides a solid grounding in the fundamental concepts of mathematics and physics, while still allowing students the freedom to explore diverse interests in other areas of the liberal arts. Innovative and engaging entry-level courses for freshmen, together with a close linkage to Carroll's strong program in applied mathematics, are distinctive features of the physics major program. Students completing this program should be well-prepared for either employment or graduate study in physics or related technical areas. communicate effectively, whether orally or in writing, with both technical and non-technical audiences. We have created a unique freshman curriculum, which clearly distinguishes us from physics programs at other institutions. Most physics programs begin with a year-long freshman "general physics" sequence, taken simultaneously with freshman calculus, in which students study Newtonian mechanics in the fall and electricity and magnetism in the spring. Instead, our physics majors take this course in the sophomore year. In this way students have already completed their study of calculus before beginning the sequence, and they have the additional maturity and study skills that students have developed by their sophomore year. As a result, our experience is that by teaching this sequence to sophomores rather than freshmen, we have increased student success rates. Our major begins with two unique courses which will both serve as the freshman curriculum for our physics major, and satisfy the general CORE requirement for a natural science lab course. These courses introduce some of the most interesting and stimulating aspects of contemporary physics, thus drawing more students into the program: Students won’t have to wait until their junior and senior years to explore cutting-edge topics. In the fall, students take PHYS 155 (Robotics and Experimental Physics), in which they will learn to build and program robotic devices, and study crucial laboratory methods. In the spring, students will take PHYS 160 (Einstein’s Physics), in which they will study Einstein’s theory of special relativity and the concepts of quantum mechanics, discussing intriguing ideas like the famous Schrödinger’s cat paradox. By placing these fun and exciting courses right up front, in the freshman curriculum of our physics major, and delaying the more quantitatively challenging general physics sequence to the sophomore year, our curriculum will help students be more successful in this program. Physics majors can go on to careers in fields such as computer science, engineering, and research and development. Others have referred to physics as the "Swiss Army Knife" degree because of all the skills that students acquire from a major in physics. Physics majors have a reputation for solid mathematical skills, strong problem solving ability, and good work ethic. It is these fundamental skills that allow them to work successfully in so many different areas. 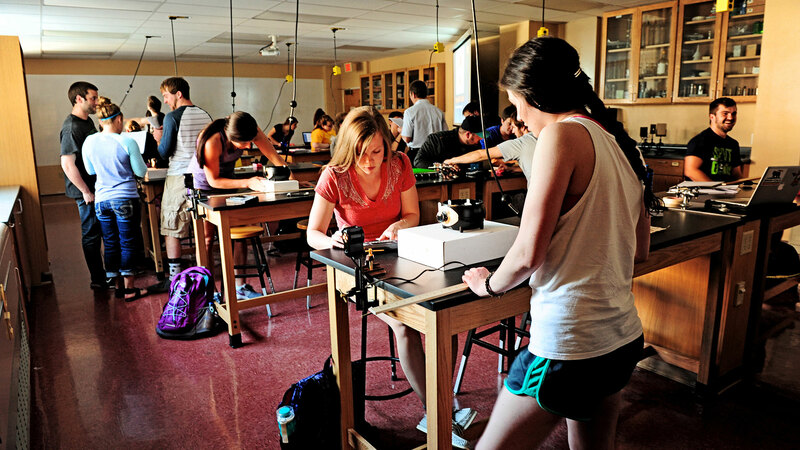 A new physics class is giving Carroll College students a more hands-on learning experience. The Robotics and Experimental Physics course, taught by Dr. Kelly Cline, is part of a new physics major being offered at Carroll. Beartooth NBC’s Charlie Misra spoke with Professor Cline about his new physics class, which he describes as exciting and dynamic. Cline says, "We present these challenges and then different groups and different teams solve them in different ways. And so it's a way that people can be creative and try different ways of exploring things and every group has their own unique ideas." You’ll learn much of the physics needed for summer Research Experiences for Undergraduates (“REU’s”) in cutting-edge problems at universities across the country. You’ll know more about how the universe works than most other science, engineering, or math majors.